How to make discover knowledges not related to game objectives? Some chunks of knowledge cannot be easily inserted into the game progression or related to game objectives without decreasing the feeling of fun. Exhibit this knowledge in virtual places consistent with the game world. Design exhibition places that users can visit without game pressure. It is important that this place reuses the representations and tones of the game world in order not to be perceived as totally separate places. If users liked your game world, they could be interested in visiting the museum like a bonus experience. 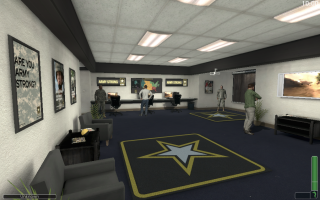 For example, in Americas-Army, a virtual recrutment place can be accessed from the main menu. The user visits this place using the same movements as in the game. This place provides information about army through posters on walls or characters which can be interviewed (see picture).